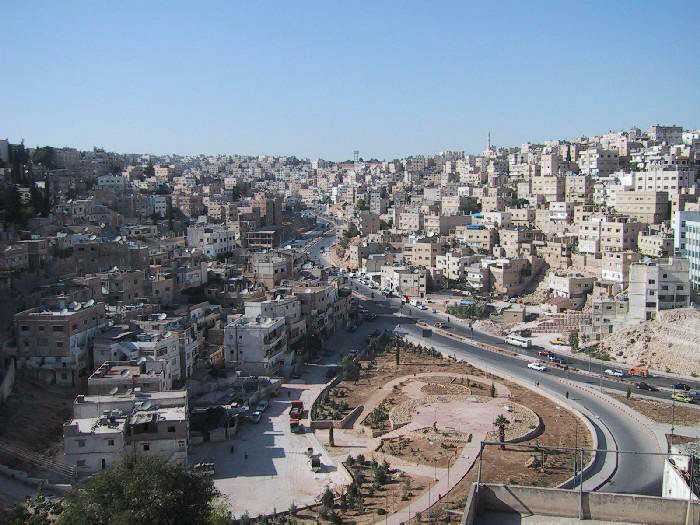 Amman is built on seven hills, or jabals, each of which more or less defines a neighborhood. 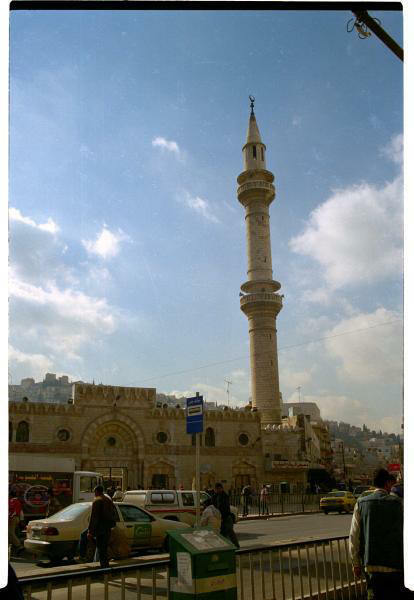 Most jabals once had a traffic circle, and although most of these have now been replaced by traffic lights, Amman’s geography is often described in reference to the eight circles which form the spine of the city. First Circle is located near downtown, an d the series extends westward through Eighth Circle. 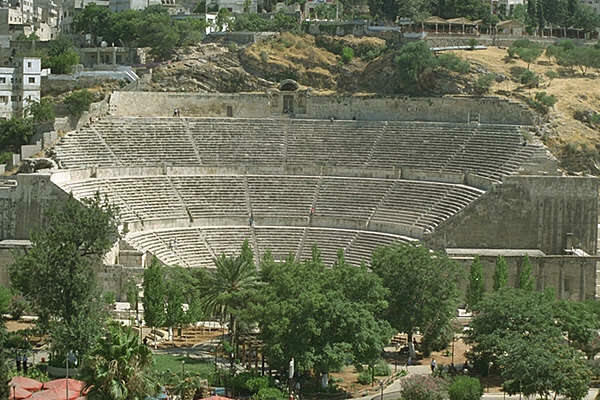 Two small museums are built into the foundations of the Roman theater. The Jordan Folklore Museum is in the right wing of the theater and displays a collection of items showing the traditional life of local people. At the other end of the theater stage, the Museum of Popular Traditions displays traditional Jordanian costumes, including fine embroidery and beautiful antique jewelry. It also houses several sixth-century mosaics from Madaba and Jerash. The Museum o f Popular Traditions is open daily 09:00-17:00, and closed on Tuesday. The Jordan Folklore Museum is open every day from 09:00-17:00, except Friday when its hours are 10:00-16:00.
caravan routes for many years, but eventually trade patterns shifted and dried up the lifeblood of Amman. The city declined to little more than a provincial village for many centuries. Amman’s "modern" history began in the late 19th century, when the Ottomans resettled a colony of Circassian emigrants there in 1878. Many of their descendants still reside in Amman. During that time and the early decades of the 20th century, the neighboring city of Salt was more important as a regional administrative and political center. However, after the Great Arab Revolt secured the state of Transjordan, Emir Abdullah bin al-Hussein made Amman his capital in 1921. Since then, the city has grown by leaps and bounds into a modern, thriving metropolis of well over a million people. 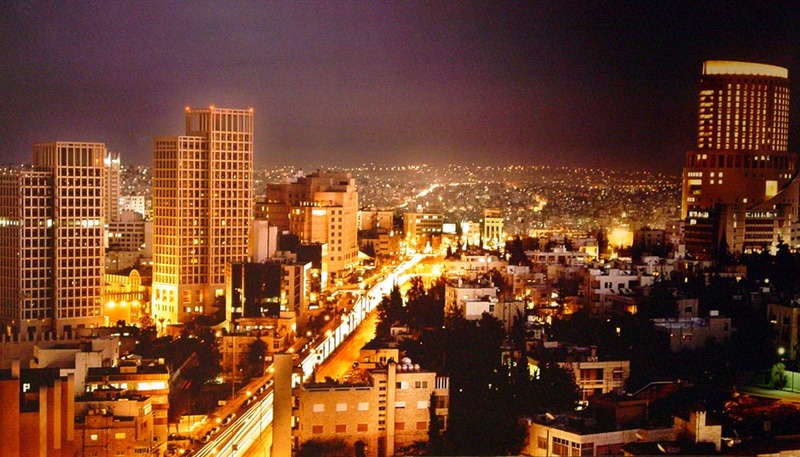 Amman’s growth has been driven largely by political events in the region, and especially by the Arab-Israeli conflict. After the wars of 1948 and 1967, successive waves of Palestinian refugees ended up in Amman. Moreover, the city’s population was further expanded by another wave of immigrants arriving from Iraq and Kuwait during the 1990-91 Gulf Crisis. 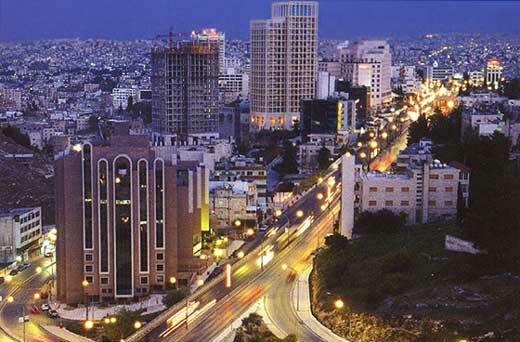 Amman has served as the modern and ancient capital of Jordan. It is one of the oldest continuously inhabited cities in the world, with a 1994 excavation uncovering homes and towers believed to have been built during the Stone A ge, circa 7000 BCE. There are many Biblical references to the city, which by about 1200 BCE had become the Ammonite capital of Rabbath-Ammon. The Ammonites fought numerous wars with Saul, David and others.